Stewart, John R. and Ken Favrholdt. "Revelstoke". The Canadian Encyclopedia, 17 January 2017, Historica Canada. https://www.thecanadianencyclopedia.ca/en/article/revelstoke. Accessed 18 April 2019. 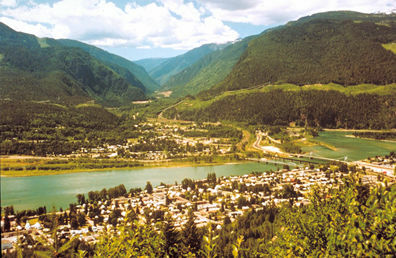 Revelstoke, BC, incorporated as a city in 1899, population 7139 (2011c), 7230 (2006c). The City of Revelstoke is situated on the Columbia River between the Selkirk and Monashee mountains, on the Trans-Canada Highway at the western entrance to Rogers Pass and Mount Revelstoke and glacier national parks. 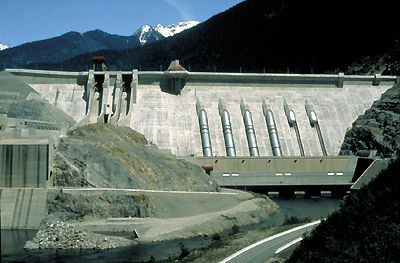 The Revelstoke Dam was built after an international agreement to make American downstream power plants more effective (courtesy BC Hydro and Power). On Upper Arrow Lake, on the Columbia River in central BC (photo by James Marsh). Explorer David Thompson was the first European to travel past the site of Revelstoke in 1811. The area was eventually settled in the mid-1800s and by the 1870s was known as "Big Eddy" and "Second Crossing" (of the Columbia River). The original townsite, laid out in 1884, was named Farwell after a surveyor. In 1886 the new Canadian Pacific Railway (CPR) station just to the west was named Revelstoke after Lord Revelstoke, whose British bank had invested in the CPR. Mining and the railway spurred the community's growth. In 1899 Revelstoke became the mountain divisional centre for the CPR, and for many years it was the western entrance to the old Big Bend Highway along the Columbia River through the Selkirk Mountains. Today the CPR remains an important employer, along with forestry and tourism. Mining has contributed little to the economy since the closing of a nearby copper mine in 1996. The downtown has been revitalized by restoring many of its old brick buildings. The former post office and customs building (built 1926) houses the district's museum. A railway museum acknowledges Revelstoke's major transportation role. Mount Mackenzie nearby has major potential as a ski resort. The city has a number of festivals including Timber Days (logging sports event) and the Mountain Arts Festival (visual and performing arts). Revelstoke Dam, one of the highest concrete dams in Canada, is located 5 km north. RevelstokeThe official website for the City of Revelstoke, BC.